So, while I have been critical of “our” mainstream media, in this respect, I must acknowledge there are rare examples where it will allow the truth to break through. Ironically, I see the video above from the New York Times as the exception proving the rule. The video shows burning of “aid” trucks on the Venezuelan-Columbian border – widely reported by “our” media and politicians as an act of infamy by the Venezuelan side. Readers of alternative media know better having already seen videos showing use of Molotov cocktails by anti-Venezuelan protesters. But now, the New York Times, shows “our” mainstream media and politicians were wrong. And this disinformation, together with its multiplication by prominent USA politicians, had serious consequences. Not only in spreading more anti-Venezuelan propaganda, but in the US imposing even more sanctions on that suffering country. The Integrity Initiative logo. Don’t be fooled by the words”democracy”: and “disinformation” – they often come out of the mouths of scoundrels these days. Recent exposure of a shady organisation, the Integrity Initiative, has exposed how media, “think tanks” and politicians are mobilised in campaigns to manipulate public opinion and achieve political objectives. leaked documents show how this is funded by states (in this case the UK) as well as private interests. Don’t be fooled by the term “Russian disinformation.” This really means any information the NATO states want to keep hidden or information with a different spin to that preferred by the NATO establishment. The documents show the mechanism the Integrity Initiative uses to influence public and political opinions. This uses “clusters” of journalists, politicians, the staff of “think tanks” and state bodies like the Ministry of Defence. And no doubt intelligence agents will be in there somewhere. The most public part of this “engagement” will be media campaigns. Leaked documents from this groups give an example of one of their successful campaigns – the reversal of the planned appointment of Pedro Baños as Director of National Security in Spain. “[He] started working as an analyst at the General Secretariat of the Army Staff in 1999 and in 2001, for three years, he was Head of Counterintelligence and Security of the European Army in Strasbourg . 3 From 2004 to 2010 he served as Professor of Strategy and International Relations at the Higher School of the Armed Forces. From 2010 to 2012 he was assigned to the Strategic Affairs and Security Division of the General Secretariat for Defense Policy, as head of the Geopolitical Analysis Area, and in 2012 he moved to stand-by working later as an analyst and autonomous lecturer. He has worked at the European Parliament’s headquarters in Brussels as a military adviser and has participated in three missions in Bosnia-Herzegovina ( UNPROFOR , SFOR and EUFOR ). The news report “Sanchez dismisses Pedro Baños as director of National Security and finally opts for General Ballesteros” describes the event in the last sentence above. This outfit claims private funding for the early years but is now funded by the UK government to the tune of over 2 million pounds per year. This is acknowledged by the outfit itself – a bit hard to deny as the leaked documents come largely from their funding applications. The leaked documents contain information for cluster groups in a number of European countries. I will just list one example here – the members of the UK cluster in its subgroups. The cluster is led by Keith Sargent – a member of The Institute for Statecraft according to his email address. (The leaked documents contain email address but I have not included them in the post as I hesitate to show personal information. However, readers can access the leaked document with these addresses here –392195849-UK-Cluster). This contains 15 staff and 3 fellows so gives some idea of the financial backing and size of the UK cluster. I have provided names for members of the other clusters as readers will no doubt recognise some of these people. The email addresses show a number of members of the Foreign Office and Ministry of Defence in this sub-cluster. This list contains several members of parliament and staff of government departments. Baiba Braze’s email address is for the UK embassy in Latvia. Agnes Josa’s email address is for the Government of Catalonia. These journalists work for The Times, The BBC and the Financial Times. It is naive to think that the frequent political campaigns we see arise spontaneously. These leaked documents provide one illustration of how such campaigns can be launched and coordinated. How they are facilitated by links between think tanks, military, and state departments, politicians and journalists. It is logical that these networks will also contain intelligence agents. Although this organisation and similar ones promote themselves as fighting “disinformation” readers would be naive to taker them at their word. They often promote disinformation or fake news themselves, or at least provide a spin on events and news promoting a state and ideologically approved narrative. The mainstream media is clearly integrated into such networks – which should make readers think twice about the news this media presents. My advice is to always approach the media, all media, critically and intelligently. And to include alternative sources of information in one’s day-to-day reading. Policing social media – who is coming next and who is behind it? The Real News video discussion with Max Blumenthal above warns that this censorship is a slippery slope – a slope along which we have already slipped well past Infowars. Blumenthal gives examples where his own media presence has been censored. Blumenthal also warns that those doing this policing of social media are hardly humanitarians attempting to prevent hate speech. They have deep political and military origins which are driving this activity. I find very disturbing that Facebook and the Atlantic Council are now cooperating in policing of Facebook content and in directing social media users to “approved” and “official” news sources (see Atlantic Council press release: Atlantic Council’s Digital Forensic Research Lab Partners with Facebook to Combat Disinformation in Democratic Elections). So we will now have a NATO-aligned “think tank” controlling information US voters, and the rest of us, get via social media. An organisation which is also strongly linked to outfits like the terrorist aligned White Helmets in Syria, the nationalist regime in Ukraine and conspiracy theorist “open sources” like Bellingcat. Hopefully, readers will watch this video and its follow-up. I know some readers will see this as just another conspiracy theory. Apparently, they believe I am prone to such theories and urge me to wear blinkers and restrict my news sources to just the approved “official” sources. Perhaps, instead of their outright rejection of the video above, they should critically consider the conspiracy theories they adhere to. The “official” conspiracy theories promoted by their “approved,” “official,” mainstream media sources. The conspiracy theories that get the blessing of outfits like The Atlantic Council, the Ukrainian regime and Bellingcat. The video below is satirical – but really – how different is its content to the “official” “Russiagate,” conspiracy theory our mainstream media is bombarding us with every day. Apparently, US society is really utopian – it has no problems. All the conflicts we read about are caused by those pesky Russians and their president, Putin. Also, the video below from Syriana Analysis raises warnings about the slippery slope organisations like the Atlantic Council, are moving us down. Many people like me rely on multiple sources for information. The mainstream media (which never seems to be censored by these social media or the Atlantic Council) inevitably follows the official narrative on many issues (consider Syria, Russia, etc.). They often give fake news or misrepresent information (see, for example, Blatant misreporting of latest OPCW report on chemical weapons in Syria and The “heart of the Syrian chemical weapons programme” destroyed?). A wise person uses multiple sources, including independent or alternative media, to avoid this sort of control on information. Syriana Analysis is one of the many sources I often check out for information on Syria. Independent sources like this rely heavily on social media like Facebook, Twitter and YouTube to get out their message and to get financial support for their work. Its spokesperson describes some of the hassles his organisation faces from social media bans and censorship. Many other independent or alternative media sources describe similar problems. Some people object to using the word “censorship” to describe this problem. They point out that even big corporations like YouTube, Facebook and Twitter have a perfect right to decide how their businesses operate. That the government is not involved. I don’t think attempts to censor social media and close down independent and alternative media sources are going to succeed, at least permanently. The internet has let the genie out of the bottle. Official mainstream media and the political establishment can no longer control the information available to those who look for it. At least I hope that genie is out of the bottle. Professor Cohen is always good value and we should take these comments of his seriously. After all, there is nothing more serious today than the threat of war between the US and the Russian Federation. Yet we have politicians and the mainstream media preferring to promote this threat. They seem to want to prevent any step towards relaxing international tension and divert attention by waving their dirty domestic laundry on the international scene. Yes I know, I will probably be attacked (again) for using a clip from Tucker Carlson and Fox. There seems to be a knee-jerk reaction to ignore or reject serious arguments because they appear on a “non-approved,” “non-official,” or alternative media. But be honest – that reaction, and the fact it is a knee-jerk one, simply demonstrates the self-censorship which people have had imposed on them. Particularly in this case where Professor Cohen is not given any space on the “liberal-approved” mainstream media to present his highly sensible views. The worst aspect of all this is the diversion of public opinion from what should be the substance of such summits. What is this media hysteria and bullying, and self-censorship, doing? It is preventing consideration of the real content of this important international summit. Where is the media discussion on questions (and possible moves towards agreement on these questions) like a return to the Start Nuclear Treaty, the danger presented by stationing anti-ballistic missile systems in Europe, problems created by US withdrawal from the Iran Treaty and the Paris climate change agreements, provision of security for Israel, settlement of the war in Syria, humanitarian aid to the victims of that war, the fight against terrorism, a treaty on cyberwar, etc., etc? Things that really matter and affect the future of this planet and its people. Why is it that US journalists at the Summit press conference showed absolutely no interest in these substantive issues? They were simply there to fight out their non-acceptance of the 2016 election result. I think this is disgusting. Instead of attempting to prevent war and to do something substantial to reduce international tension the US establishment is carrying out their dirty domestic partisan warfare in public. We have a media-intelligence agency coalition fighting with a President who (maybe wisely) refuses to take the fight head on. A strong president might be expected to take on an intelligence establishment which has become partisan and is actively constricting his actions. Instead, he appears to mumble and backtrack like a coward. No sensible person would ever claim to have full confidence in the US intelligence establishment – come on, look at their record. But meanwhile the real interests of people in the US, and indeed the world, get ignored by a compliant media. And groups and commenters on social media get sucked in by this circus like easy fools. Come on, there are real problems in the world – the Trump circus is a diversion imposed on you by the US media-political-intelligence establishment. An establishment which still works, behind the smokescreen they have created, to impose their diktat on the world. Hala Jaber, highly Respected Middle East correspondent and author of The Flying Carpet of Small Miracles: A Woman’s Fight to Save Two Orphans.” Image Credit: Goodreads. Readers and viewers are aggressively being directed away from alternative news sources. OK, readers here will have picked up on the tone of some of my recent posts so will not be surprised that I think this way. But, let’s be clear, it is not only me. “In my entire career, spanning more than three decades of professional journalism, I have never seen MSM resolve to such ugly smear campaigns & hit pieces against those questioning mainstream narratives, with a different view point, as I have seen on Syria, recently. This is a dangerous manoeuvre a witch hunt in fact, aimed not only at character assassination, but at attempting to silence those who think differently or even sway from mainstream & state narrative. It would have been more productive, to actually question the reason why more & more people are indeed turning to alternative voices for information & news, than to dish out ad hominem smears aimed at intimidating by labelling alternative voices as conspirators or apologists. The journalists, activists, professors & citizens under attack are presenting an alternative view point. Surely, people are entitled to hear those and are intelligent enough to make their own judgments. Or is there an assumption, (patronizing, if so), that the tens of thousands of people collectively following these alternative voices are too dumb & unintelligent to reach their own conclusions by sifting through the mass information being dished at them daily from all sides? Moon of Alabama provides an excellent summary of recent events – far better than what I tried to do with the same material. So I will just quote from their article – The Media War On Truthful Reporting And Legitimate Opinions – A Documentary. They even provided a browser add-on which would warn you that you were reading material from a website they classified as a “Russian propaganda outlet.” Despite being promoted by some of the mainstream media it was considered a bit of a joke – independent writers and sources who missed out on the classification were somewhat pissed off. It still exists as a promoter of extreme Russophobic views on Twitter (PropOrNot ID Service‏ @propornot). “Russia did not respond militarily to the Friday strike, but American officials noted a sharp spike in Russian online activity around the time it was launched. “One suspects that Holton used the bizzare statistic of the infamous ‘Dashboard‘ created by the neoconservative, anti-Russian lobby. 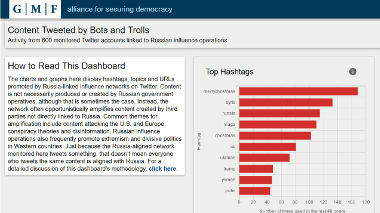 The dashboard creators asserted that the use of certain hashtags is a sign of ‘Russian bots’. On December 25 the dashboard showed that Russian trolls and bots made extensive use of the hashtag #MerryChristmas to undermine America’s moral. Both these independent reporters have provided important eye-witness reports from Syria and done much to expose how our mainstream media misrepresents the situation. I referred to Vanessa Beeley’s reports in my articles Anti-Syrian propaganda and the White Helmets, White Helmets dupes New Zealand government? and The first casualty . . The crude level of these claims is indicated by the fact that @ValLisitsa is the twitter account of Valentina Lisitsa, a famous American-Ukrainian pianist. Yet these interviewers ask a flesh and blood person if he is a bot! Also, they had the hypocrisy to suggest he may not be carefully checking out the veracity of the stories he retweets – a question they never put to the government spokespersons and media journalists who make these unverified and stupid claims all the time. 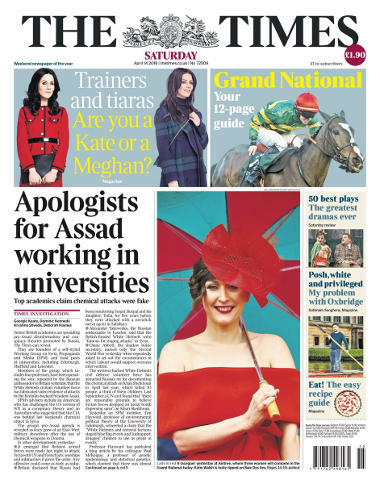 “On April 14 Murdoch’s London Times took personal aim at the members of a group of British academics who assembled to scientifically investigate dubious claims against Syria. Their first investigation report though, was about the Skripal incident in Salisbury. The London Times also targeted Bartlett and Beeley. The piece was leading on page one with the headline: “Apologists for Assad working in universities”. A page two splash and an editorial complemented the full fledged attack on the livelihood of the scientists. “Russia used trolls and bots to unleash disinformation on to social media in the wake of the Salisbury poisoning, according to fresh Whitehall analysis. Government sources said experts had uncovered an increase of up to 4,000% in the spread of propaganda from Russia-based accounts since the attack,– many of which were identifiable as automated bots. But civil servants identified a sharp increase in the flow of fake news after the Salisbury poisoning, which continued in the runup to the airstrikes on Syria. I think that sums up the complete abandonment of their job by many mainstream media and why the term “stenographer” to describe them is so justified. Ian Shilling (@Ian56789) posted a similar tweet illustrating how the figures given for his tweets were also highly inflated. “Early in life I have noticed that no event is ever correctly reported in a newspaper, but in Spain, for the first time, I saw newspaper reports which did not bear any relation to the facts, not even the relationship which is implied in an ordinary lie. I saw great battles reported where there had been no fighting, and complete silence where hundreds of men had been killed. I saw troops who had fought bravely denounced as cowards and traitors, and others who had never seen a shot fired hailed as the heroes of imaginary victories; and I saw newspapers in London retailing these lies and eager intellectuals building emotional superstructures over events that had never happened. I saw, in fact, history being written not in terms of what happened but of what ought to have happened according to various ‘party lines’. The new communication networks allow everyone to follow the war on Syria as diligently as George Orwell followed the war in Spain in which he took part. We no longer have to travel to see the differences of what really happens and what gets reported in the main stream press. We can debunk false government claims with freely available knowledge. The governments, media and their stenographers would love to go back to the old times when they were not plagued by reports and tweets from Eva, Vanessa, Ian, Maram and Sarah or by blogposts like this one. The vicious campaign against any dissenting report or opinion is a sorry attempt to go back in time and to again gain the monopoly on ‘truth’. When scientists evaluate published research we are more interested in evidence than in conclusions. In fact, the same evidence may lead scientific readers to different conclusions. That’s not surprising as in the real world no research project is able to consider all the theoretically possible evidence. Readers may, in fact, have other evidence. Or they may detect faults in authors’ interpretations. I think this is a good thing. Considering the evidence allows competent critiques to be made and encourages knowledge to advance. However, it annoys me that when we move outside the scientific environment we have to deal with situations where evidence may rarely be considered. People indulge in debating conclusions often with no regard to evidence. In fact, debaters seem to rely more on the real or perceived authority of their sources to support or discredit an argument, than on the evidence. That’s just lazy. Source authority proves nothing and I would like to think that my discussion partners are capable of coming to a more reasonable position when they are forced to actually consider the evidence. Unfortunately, both supporters and opponents of a scientific viewpoint or consensus fall into this trap. Take the “fluoridation debate.” It annoys me that some supporters of the scientific viewpoint will respond to an opponent by disparaging their sources. The fact that the opponent is citing the activist Fluoride Action Network, the “Fluoride” journal or one of the shonky pay-to-publish journals where anti-fluoride activists sometimes get published does not, in itself, discredit their argument. On the other hand, if the actual evidence involved in those reports were discussed it might just be possible for the faulty conclusions to be exposed. On the other hand, how often have I heard opponents of community water fluoridation reject the authority of scientific journals or published research because the workers were paid by the government (we must all get a wage from somewhere) or the journal or conference received industry sponsorship? I am not at all impressed by the refusal to consider the real evidence implied by falling back on disparaging sources. The other tactic of supporting a claim by pointing to the high authority of the source is also repugnant. Even researchers and journals we generally consider “reputable” can still publish flawed work and even rubbish. The odds are, of course, that those activists citing this paper in such a manner have not actually read the paper – a common problem with people who rely on the authority of their sources rather than evidence. In fact, they are probably not at all interested in the details in most cases. My point is reliance on authority is not a valid supporting argument any more than disparaging a source is a valid opposing argument. We should always follow the evidence – and rely on that evidence for our arguments in such discussions. This problem is even worse in the political sphere where so often we actually do not have evidence to fall back on. In fact, this situation seems to have got a lot worse of late where, for one reason or another, facts and evidence seem to be the last thing in the minds of “reporters” – or at least those who are continually telling us what we should think. Unfortunately, discussion of political issues often leads people to claim they are using what they think as “reliable sources” or disparaging an opponent’s argument by claiming they are using “unreliable sources.” In fact, people who should know better, seem to often support their claims against any criticism by claiming it came from a “reliable source” or “authoritative source.” And these people who should know better will often resort to “attacking the messenger.” Criticising or rejecting information because it was reported by what they consider an “unreliable source.” The facts or evidence seem to be forgotten. This can get pretty silly. I once had to confront the argument of a discussion partner who rejected the video recording of a statement made by a spokesperson for the US Department of State because it was part of a piece of RT news coverage! Especially silly as the video recording was probably an official one made by staff of the Department of State. How often do we see people promoting partisan claims about the political hysteria in the US or the war in Syria by using sources like the Washington Post, New York Times, CNN or Al-Jazeera? Sources they claim are “reliable?” In my article An Oscar for Al Qaeda? I described how the New Zealand Ministry’s of Foreign Affairs and Internal Affairs carried out “due diligence” on the White Helmets organisation they were planning to give money to by referring simply to a report from Al-Jazeera. No attempt to dig deeper, to evaluate the veracity of the Al-Jazeera reports or to follow-up other sources critical of the White Helmets. Yet Al-Jazeera has a reputation for supporting “rebels”/”terrorists” in Syria. It is shocking that a New Zealand ministry was not prepared to make a more sensible judgment. On the other hand, how often do we see people disparaging information or claims about the current US political hysteria or the war in Syria which with they disagree because it was reported by Sputnik, RT or one of a host of other “alternative” news sources? Both sides of a political argument now denigrate the sources used by the other side as promoting “fake news.” And, to an extent, each side is probably right as every news sources these days has its own point of view – its own bias. Unfortunately, many readers seem more interested in confirming their own biases than dealing with real facts or evidence. Understandably these people will select the news source that suits them. That’s OK if you simply want to follow the “party line.” But it is lazy because it avoids any intelligent or critical analysis. It is incumbent on the rest of us who are more interested in real facts and in drawing more credible conclusions to make an effort to consult a range of news sources and to critically analyse the claims, opinions and information we get from them. I believe that in today’s world there is no such thing as an authoritative or reliable source when it comes to political information. All the media – the “established mainstream media” as well as the “alternative media” are equally capable of publishing and promoting fake news. We need to be aware of this, be prepared to use a variety of sources to avoid the “party line” problem, and critically analyse what we read so we can separate facts from opinions and unsubstantiated claims. I have discovered a new word – “stovepiping.” Must admit I had to look it up – but it seems to be highly relevant to the way media seem to authenticate their news reports today – particularly in the current political hysteria emanating from the USA. And, I think, stovepiping plays a central role in the promotion of fake news. There is nothing new about fake news – we have been subjected to it for ages. But suddenly everyone is talking about it. Of course, it is always the “other” side which indulges in fake news – never “our” side. But I suggest that just demonstrates our own prejudices and confirmation bias. We should look more critically and objectively at the way “our” news media gathers and present what it feeds us. On the other hand, it may be purposely used to deceive politicians and the public (to support “certain conclusions”) – the issue of weapons of mass destruction in Iraq and the justification for the US invasion of that country provides a clear example. Unfortunately, stovepiping is rampant in the current US media and political hysteria surrounding the current political struggles resulting from an election result which didn’t go the way the establishment wanted and believed it would. The really “deeply disturbing” aspect is that this claim was repeated again and again without a sniff of evidence. Anyone questioning the claim, or asking for evidence, was jumped on as a “Kremlin troll” and no politician seemed to have the courage to draw parallels with the Emperors Clothes.” To actually ask – “where is the evidence.” Neo-McCarthyism is alive and active. This sort of stovepiping is loaded with possibilities for anyone wishing to promote evidence-free but politically damaging claims as part of a political battle. Just hand-select a few anonymous agents who you know will support the story you want. The ultimate confirmation bias. One might think the news media has the ethical responsibility to be a bit more critical of such stories. To refuse to repeat evidence-free claims. To avoid unnamed, and unchecked, sources. And to publish an analysis of the origins of these claims, stressing the lack of evidence. Unfortunately, in the USA it appears that the mainstream media has forgotten these ethics. It is wholeheartedly participating in this political battle. It is cooperating with elements in the intelligence community who have also joined this political battle. The mainstream media and this politically motivated section of the intelligence community are taking in each others laundry. Unnamed intelligence sources are providing evidence-free information to fill the news reports. The media is giving public voice to these disaffected intelligence agents and the intelligence community (or elements within it), in turn, is giving “authority” to the reported evidence-free claims. After all, what patriotically-minded US citizen will refuse to accept the authority of the intelligence agencies – even without evidence? Weak retractions, or even the absence of retractions, seems to be an accepted procedure within the mainstream media. Remember Omran Dogneesh, the “Aleppo boy?” Much media hysteria was spent on his story (accompanied by an admittedly outstanding photograph) promoted by the al Qaeda-affiliated White Helmets as part of their propaganda campaign against Syria. His family was liberated with the rest of eastern Aleppo and they can now tell their story about the way their boy was used – in effect kidnapped by the White Helmets – for propaganda purposes. His family’s story has been reported to some extent – certainly without any of the fanfare the original misleading story was promoted (see How Omran, the dazed Aleppo boy who reappeared this week, became a political pawn in Syria’s war). And a gullible public will be encouraged to continue to believe the original distortions. Just as “authoritative” mainstream media sources continue to report that 17 intelligence agencies had a “high confidence” the Russians “hacked” the US elections. While this example of stovepiping and fake news is typical of the current political conflict in the USA the problem is not going to go away when that conflict disappears. I think stovepiping and fake news have resulted from the danger the established news media sees itself in as a result of social media and wider digital sources for news. In fact, when we look at the intelligence reports about the so-called Russian hacking of the US elections we find the main concern being expressed is the possible influence of alternative media. These reports concentrate on media like RT and Sputnik which have Russian origins – but the concern is really about alternative media in general. After all, if the best they can do is complain that RT gave coverage to minority candidates and ran one interview with Trump then we can see what their crime is. RT and Sputnik, just like the rest of the alternative media, is not under the thumb of the establishment. They are free to question the narrative promoted by that establishment. The alternative media, just like the internet, is not going to go away. It will persist and it will provide alternatives to those of us tired by the conformity and fake news of the establishment mainstream media. The political establishment in the US and Europe is trying to nip this phenomenon in the bud – after all the alternative media has limited reach so far. But the establishment can see the danger it represents and we cannot avoid the possibility it may take extreme action to prevent the loss of its influence a wider spread of alternative media represents.